The Two Rivers team is excited about the early-season fishing that we have been having. The fish are looking great coming off a long winter, and they are hungry! 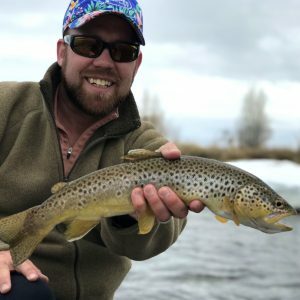 We are seeing some really nice browns come to the boat already this April and the second half of this month should be fantastic! If you’re looking for an early season float trip, without crowds-give us a call this week. We still have some open spots in the next few weeks and some eager guides ready to get out on the water with you. 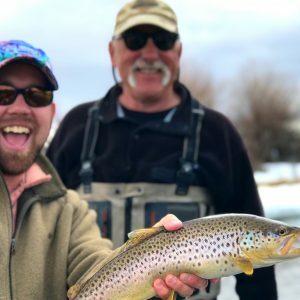 It has been a phenomenal winter and spring with lots of precipitation, so we are psyched for the upcoming season and can’t wait to catch more fish, get the drift boats out, get a sunburn, and have lots of laughs on the water. 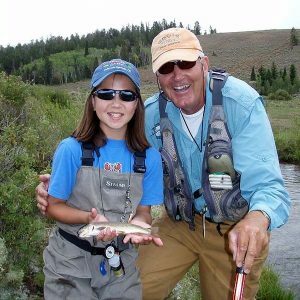 Come spend a few days with us this season and see what the Pinedale area trout water has to offer. The Green River is opening up daily and will continue to improve for fishing conditions over the next few weeks. There are a few float-able sections, but the boat ramp access is the main issue. If you like to walk -wade the river this time of the year, the fish hatchery access is fishing really good! The warren bridge area is still snowed in for vehicles, but if you hike in a little the fishing is worth it! Flies to try: Streamers in white, black, yellow and green. The fly is not as important as HOW you fish it! Worms in red, purple, and pink are working well. The New Fork is fishing well right now and boats are accessing the river on a few sections. The fish are not feeding much until late afternoon, but the days can be incredible this time of the year. Wildlife, fish, solitude, and some fresh air from the cabin fever always feeds the soul! We have taken a handful of trips down this little gem of a river and had some great fish being caught. If you have any interest in checking out the new fork river, call now! The same flies that have been working for the Green are working on the Fork. Most anglers are streamer fishing this time of the year! HEAD’S UP: July is nearly booked out. If you are looking to get on the water in the month of July, reach out to us ASAP before it’s too late. Soda Lake: Will be opening next month and like everyone who knows about this lake, we can’t wait! This lake is truly one-of-a-kind and offers almost any level of angler a challenging and rewarding day! From big browns and monster brook trout-Soda lake is a must-do for any angler’s bucket list! Our shop has custom-tied flies just for this fishery and if you have been out there before, you know that timing and fly selection are everything, so get your lake fly line dusted off or check out the TRFC shop for our full line of lake sinking lines that are perfect to help you get your fly in the fish zone! Seedskadee: The fishing on the lower sections of the Green River are just heating up for 2019. Fishing is mostly done with an indicator and San Juans or Squirmie Wormies, but you will catch fish. A streamer moved very slowly with a little jigging action has been producing some strikes. A little dry fly fishing can even happen on a calm day down there, but it’s still a bit early for that. 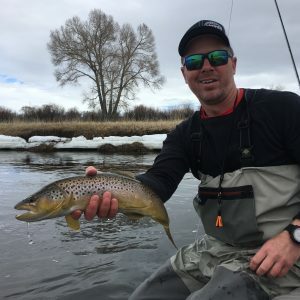 This river fishes so well early-season, when everyone thinks that high water and run off has turned the fishing, so consider booking a trip down on this section of the Green early- or mid-June. It can really be some of the best fishing of the summer. Shop Talk: We are open and getting new product in daily. We have the complete new line from Winston and a new selection of hot lines from Scientific Anglers in stock now, so don’t miss out on the new goodies. 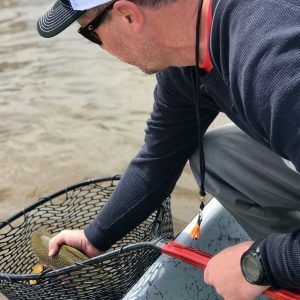 The new clothing line from Howler Brothers is legit; TRFC Co-Owner Josh swears by their pant: “Hands-down best fishing pant in the industry” so we know you’ll want to take a look at that!